The YIIFSWA Technical Advisory Committee (TAC) also met on 19 February after the review and planning workshop, to discuss the progress made and advise YIIFSWA project team on project directions. Present at the meeting were Alexandre Dansi, Hiroko Takagi-Watanabe, Janice Olawoye, Tony Sikpa, Cephas Dormediameo, Lydia Susu, Regina Sagoe, Tola Adepomola, A.O. 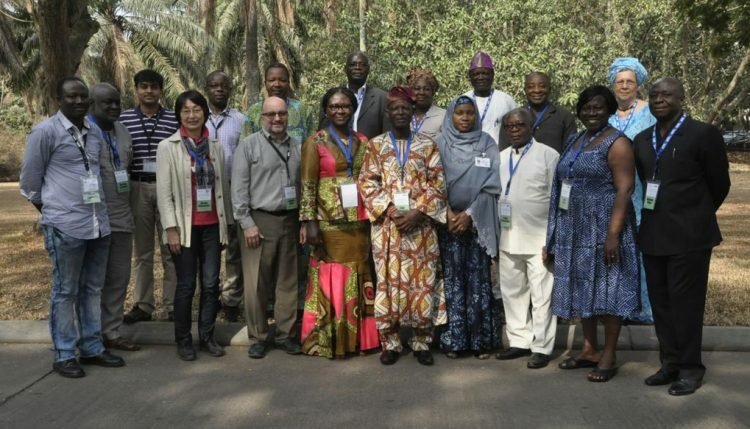 Salako, Lauren Good, Norbert Maroya, Beatrice Aighewi, Lava Kumar, Morufat Balogun, Djana Mignouna, Henry Asumadu, Haruna Braimah, John Ikeorgu, and Oiwoja Odihi. After the official opening statement by the DDG Corporate Services, Kwame Akuffo-Akoto, TAC members reviewed the execution of the previous year’s recommendations and the project activities. The main discussion points were on ensuring that the project meets its goal of increasing yam productivity (yield and net output) by 40% for 200,000 smallholder farmers in Ghana and Nigeria, as well as generation of research goods that will contribute to double income for 3 million yam producers in a 10-year horizon. The TAC members acknowledged that extensive work had been done with regard to implementing the project and delivering key research products that would contribute to improving yam productivity but more work is needed to transform YIIFSWA’s research products into tangible forms to attract the private sector into the yam production system.